Terry Boswell sold a large pair of "Arispe" endcuts a few years ago for $12,000. They were analyzed at UCLA and they were determined to be indistinguishable from Campo del Cielo (a different meteorite, worth less than ~1/5 what was paid). He refused to accept their return for a refund, and stopped replying to emails. He never returned a single phone call. We have proof that he was given the money and a carbon copy of the check that says "For Arispe." He sold fake material and won't take it back; the damaged party considers him a thief. Terry's business is called Joshua Tree Imports. They own a shop in Indiana, but their website no longer seems to be active. They are, however, still selling on ebay with the username joshuatreeimports. Terry Boswell's business and home is located in Lakeville, Indiana. It has been shown that Carl Esparza sold stones from the L5 "Mifflin" fall that, upon analysis, were found to be an equilibrated H-chondrite indistinguishable from some common (less valuable) falls from Africa. He vacillates between insisting on the stones' validity and claiming that he, himself, was defrauded. See the below link for the full story. I don't have much more to say about the matter. He regularly posts to the meteorite-list and is still selling on ebay. His ebay username is meteoritemax. Carl lives in the greater Tucson area. *It should be noted that Guido Robert Deiro Jr., IMCA member 3536, is actively choosing to trust Carl and sell material that Carl Esparza claims to have found; namely a supposed new fragment of the Cat Mountain meteorite. Deiro tried to sell the meteorite by telling prospective buyers that the finder was "a well known meteorite enthusiast" -- a statement that was misleading given Carl's relative infamy. When the identity of the finder was revealed by Michael Farmer, the sale of the stone was halted by the buyer until further studies could confirm similarities between this new stone and the original Cat Mountain find. The stone was confirmed to be an L-IMB by a reputable scientist, and it is even similar to Cat Mountain in modal abundances, per work by Dr. Ted Bunch. But, given Carl's reputation and the indisputable fact that he has sold misrepresented material on several occasions (and was unable to offer satisfying explanations for any of them), I would not trust the material unless cosmic ray exposure data or other studies beyond a simple petrographic examination/analysis suggest that these stones are paired. The necessary work has already been performed on authentic Cat Mountain material. Deiro has since returned to offering the meteorite for sale on ebay, but he has refrained from mentioning the supposed finder or Carl's name in the auction. Further examination of the stones in question has led us to believe that they are indeed different meteorites. The original Cat Mountain meteorite consisted of large unmelted clasts separated by thick veins of homogenous melt with sparse small vesicles and small metal stringers. Carl Esparza's supposed find consists entirely of melt with abundant large vesicles and large metal blebs. Texturally, these stones are very different from each other. While that *could* be accounted for by the fact that impact melts are often heterogeneous (e.g. Chico, Chergach, Gao), there's something not quite right here. With all of those other heterogenous meteorites, the areas that look different from each other are the areas that have been shocked to differing degrees. For example, there's an unmelted portion of Chico and then there's a melted portion. The same goes for Chergach and Gao. But within the respective lithologies of each of those meteorites, whether it's the shocked portion or the melted one, everything generally looks the same. We're looking at two examples of melts with drastically different textures. This would suggest that these meteorites are distinct from each other. They're also different externally. Cat Mountain was a fresh, fusion-crusted stone. Carl's supposed find is a sand-blasted, weathered fragment. In fact, it has lost at least 2-3mm of its surface to sand blasting, evidenced by the abundant protruding metal grains on its surface (enlarge last photo in ebay auction, look at top surface). Sand-blasting preferentially removes stone, leaving the harder metal inclusions protruding. That's typical weathering for a stone from Northwest Africa. Not Arizona. But such an observation is merely that - an observation. The analytical work needs to be done. All of this does not rule out the possibility that Carl Esparza could have found a funny-looking new impact melt breccia (IMB) somewhere in the Arizona desert quite near where the original Cat Mountain meteorite was found. The trouble is that Carl has also claimed to have found a number of rare meteorites that, according to an official in the Meteoritical Society, will never be approved because his integrity has come into doubt. And, IMB meteorites are rare. The likelihood of finding two different IMB's so near each other would suggest luck akin to a miracle. But, this wouldn't be the first time that Carl's claims would need to be supported by miraculous events. Read the above email (under Carl's name) regarding the Mifflin issue. Extraordinary claims [made by persons with very questionable histories] require extraordinary evidence. An update: Carl Esparza has accused Guido Deiro of having stolen the stone. Apparently, Guido Deiro claimed to have mailed it to Carl and that it had been lost. Deiro was unable to prove that the stone had been shipped; UPS claimed that the stated package was never scanned by their pick-up service. Carl further claims that Guido has threatened him with various things including, but not limited to murder, maiming, vandalism, etc. (see link above). Since Carl has something of a reputation, I don't know what to make of these claims. The two were apparently on good terms until fairly recently. Who knows. Another interesting story is starred by John Bryan Scarborough, ebay user fast*shipper, earthlytreasures2014, and lonestar*meteorites (formerly ebay usernames quietstorm2476 and meteoritekid). The Deport issue is particularly interesting because the "Deport" that he has sold is indistinguishable from a meteorite that Scarborough claimed to have found in Texas and that he later had professionally cut by Marlin Cilz. When Dr. John Wasson analyzed Scarborough's supposed find, it turned out to be identical to Campo del Cielo in all respects. - It seems that all of the "Deport" slices John has sold were from this "find," but irrefutable proof is hard to obtain in such a case. Both Tony Irving and John Wasson were willing to state that the meteorites were indistinguishable and that the preparation of the specimens appeared to be Marlin's work. Marlin confirmed that he had not done any similar work for John/Bryan, who still owes him several hundred dollars for the job, as of 9/2011. 4) "Mifflin" that turned out to be an equilibrated H-chondrite. Mifflin is an L5. In addition to the material that originated from Carl Esparza, it has become apparent that Scarborough must have had his own source of fake material. Carl reportedly purchased three individuals with Greg Catterton, which Catterton subsequently cut and sold. Scarborough sold at least one other small, complete stone that, upon cutting, was determined to be an H-chondrite. One other stone was suspect, but the buyer preferred to leave it intact and unconfirmed. I was able to locate and personally talk to the source he named for one of his complete stones, but the person, an elderly man living in Antioch, Illinois, claimed complete ignorance of John/Bryan and of meteorites in general, casting doubt on Bryan's claims. 5) "Oum Dreyga" slices that were identical to slices of an "unclassified NWA" he had sold previously. The "sister slices" (neighboring slices from the same stone) appeared to come from an LL chondrite and did not resemble Oum Dreyga. Whether he was defrauded or is passing on stones he purchased as something else is unknown. What we do know without any doubt is that John/Bryan has sold some quantity of misrepresented material that he said was from the falls/finds of Zunhua, Ash Creek, Mifflin, Deport, and Oum Dreyga. I'd like to stress that I am not accusing John/Bryan of fraud, because I do not have indisputable proof of any such actions. He may simply be an overly-trusting dealer who bought several misrepresented meteorites from dishonest sources. Draw your own conclusions. 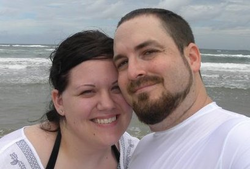 John Bryan lives in Ladonia, Texas. This website has a clean layout, and the owner is an IMCA member. It looks legitimate. A quick check of the site's offerings, however, raises some serious issues. Misrepresented material includes NWA 7034, Gao, Forrest, Zag, "Hammada al Hamra," "DaG," "Dar al Gani," Bensour, Oum Rokba, and more. Specimens that may be mislabeled include Canyon Diablo (resembles Campo del Cielo), Puerto Lapice (resembles Camel Donga), and many others. The seller repeatedly gives nondescript NWA chondrites the locales and names of less common meteorites. Again, these sellers appear to be in the IMCA. A "Gao" specimen being offered for sale on Litos.net. It is NWA 869. "Forrest 002" sold by Litos.net. Weathering is typical of NWA meteorites. Shiny surface is due to natural sandblasting, which does not occur in Australia. 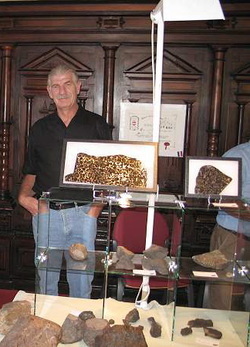 Ron Farrell, of "The Universe Collection," has been accused of a number of things, and has been arrested for trying to steal a rare meteorite from a Brazilian museum. His defense suggested that the curator wished to frame him. Random Samples, Volume 277, Number 5328, Issue of 15 August 1997. "A well-known meteorite dealer is being detained in a federal prison in Rio de Janeiro for allegedly stealing valuable meteorites from Brazil's National Museum. Ronald Farrell, 43, head of Bethany Sciences in Bethany, Connecticut, is a familiar figure to many museum curators and meteoriticists. The extraterrestrial chunks he specializes in have been a hot commodity ever since the mid-1980s, when data from Viking probes showed that some were from Mars. In June, Farrell and colleague Frederick Marcelli arrived in Rio to do some meteorite trading at the National Museum and a museum run by the National Department of Mineral Production. Astronomer Elisabeth Zucolotto, curator of the National Museum's meteorite collection, says that on 20 June she drove the dealers to the airport. According to Zucolotto, when she returned to the museum, she discovered that ordinary rocks had been substituted for three meteorite pieces. She called the police, she says, and rushed back to the airport, where the missing rocks were allegedly found in a small box hidden in a shoe in Farrell's luggage. The pair was arrested and charged with theft. One of the specimens is “considered a Brazilian national treasure,” says Smithsonian Institution meteoriticist Roy Clarke. Called the Angra dos Reis after where it was found in Brazil in 1869, the 4.6-billion-year-old, 67-gram rock is unique in that it is made up almost purely of augite, a black, volcanic mineral. Farrell says he was framed. His lawyer, Deborah Srour of Barry Fischer and Associates in New York City, says Zucolotto could have planted the rocks in the luggage. Zucolotto says that would have been impossible. At the end of July a judge held a hearing to listen to the accusers' case. Lawyer Fischer says the defendants are currently presenting evidence to the judge in hopes of getting released prior to the trial, which has not yet been scheduled." ©1997 by American Association for the Advancement of Science. When Australian meteorites were common and worth less than meteorites from other localities, it was suggested that Ron bought some and tried to say that they were from various places in the US (so that he could sell them for more). These meteorites were given the names Nova 001, Nova 002, etc. -- by scientists. They were names that did not apply to any place in particular, because the scientists in charge of approving the meteorites recognized that their localities were in question. I cannot speak for the validity of these claims, but if he wishes to contest them, I suggest he take it up with the Meteoritical Society. They are the ones who decided to rename his submissions. I assume that they have adequate evidence for such an action. He used to sell with the company name "Bethany Sciences," but has since changed the name of his business to "The Universe Collection," and we have heard that he is has become partners with Terry Boswell (see above). I couldn't find a photo of Ron. Submissions are welcome. His business is listed as being located in New Haven, Connecticut. Carl Esparza - Was removed from the IMCA prior to the Mifflin issue, apparently due to confirmed misrepresentation of some aspect of his ebay auctions. Greg Catterton - Passed on much of the "Mifflin" supplied by Carl Esparza (see above). He claimed that he did so unknowingly. Catterton also attempted to start a museum in his home town -- an idea which was not ultimately realized. He did finally return some of the donations for his failed museum nearly a year after ceasing to post vague progress reports to the meteorite-list, but he has not been proactive in doing so, and some IMCA members (and others?) remain un-reimbursed as of late 2011. In fact, when one person asked for the return of donated items, Catteron was quoted as saying that he would return "what was left," so it would seem that he sold at least some of the donations for his museum. Whether he did so for "funding" or personal gain is unclear, but we've heard that he did not return the difference in money. Since the museum still does not exist, regardless of the intent, the end result is the same. He continues to sell meteorites on facebook and ebay with the username "wanderingstarmeteorites" and "freedom_factory." Greg has lately been selling on ebay using the ID "freedom factory." Bob Evans - Sold and traded pieces of "Zulu Queen," supposedly traded out of UCLA's collection. The trouble is that UCLA later confirmed that they had never traded any -- to anyone, ever. Because they never had any Zulu Queen in the first place. His ebay username is maccers531. The links contain some damning statements. Martin Altmann and Stefan Ralew - These partners resigned from the IMCA because they refused to refund a buyer after promising a money-back guarantee...on a six-figure deal. If you offer a refund for a given period, you've got to honor it. We don't know them well personally, and have heard good things over the years, but, as best we can tell, they've not refunded the unhappy buyer and quit the IMCA to avoid facing action. Martin and Stefan have a following in Germany and are generally regarded as honest dealers. It seems that they simply didn't follow safe business practices in this case, and found themselves unable to offer the promised refund, but they never admitted to wrongdoing or responded to the claims against them, so we don't know what the deal is. This list is incomplete. Information will be added as it becomes available. 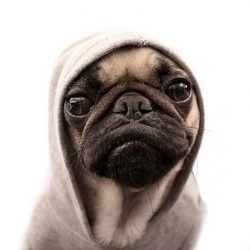 And it's important to remember: an IMCA guarantee is not necessarily a good one. Fake Mifflin and other meteorites were circulated by 'honest' members of the IMCA for several months before the material was ousted by someone outside the organization. Such things are often missed by the majority of even the board of the IMCA, and those same board-members have sold misrepresented material, apparently because they didn't know better. The IMCA started out as a well-intentioned group, but at least one board-member has since boasted of poaching Canyon Diablo's from private land at night, and several have maintained websites showcasing and selling misidentified meteorites that they did not fix/remove after being notified. There is no reason to trust a member of the group more than you might trust a dealer at large. Honest members have been forced out of the group by dishonest parties, and dishonest members remain in the group (and have served on the board) thanks to political ties, legal threats, and member ignorance. It seems that the IMCA board has become somewhat lax, enforcing rules selectively, and avoiding doing so when it does not suit them. One IMCA member sold of several tens of thousands of dollars of an 'amazingly unique' new meteorite, only to quietly let it fade away when scientific work showed it to be terrestrial, beyond reasonable doubt. The IMCA did not mandate that refunds be offered. Similar, often vague claims have been made by other IMCA members regarding meteorites for sale. Stan Turecki - and more. 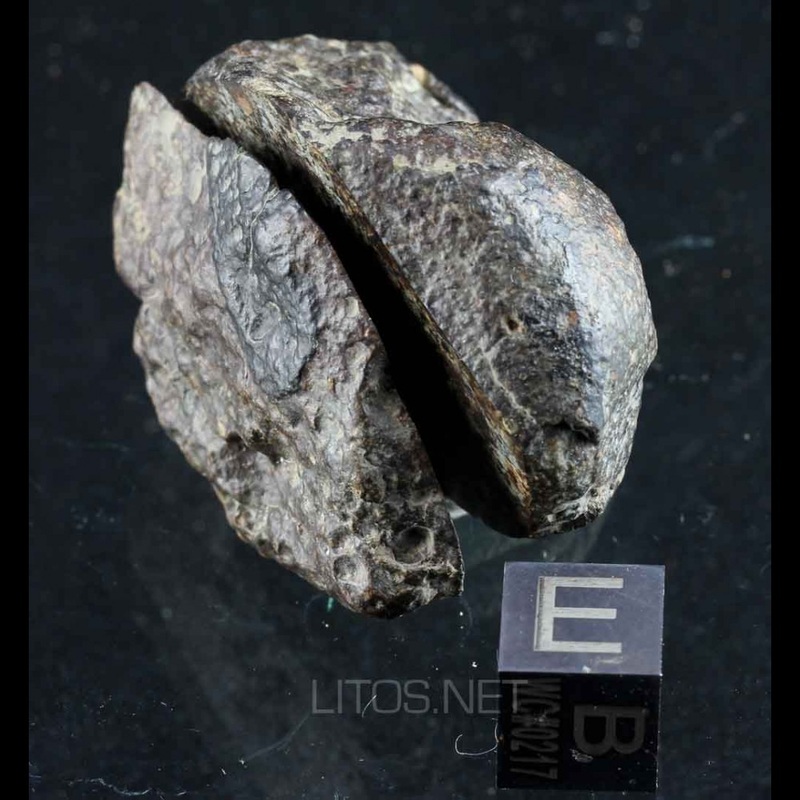 Jorge M. Gonçalves - offered a 19 gram Chelyabinsk meteorite (listed at ~$700) on ebay a week or so after the fall. The trouble is that Jorge had pulled a 19 gram Oum Dreyga from his ebay page (listed at ~$200) only days before, and, while he did take the trouble to take new photos of the specimen, the Oum Dreyga and Chelyabinsk were the same rock. Jorge posted a defensive post to the meteorite-list that, in light of the photographic evidence, suggests intentional fraud. Jorge's old ebay username was galeriacores, but it has since been changed to space-mets. He has since listed specimens of Chaves, Katol, and other rare falls that are obviously misrepresented. Jorge lives in Portugal. Jorge currently offers numerous NWA meteorites as stones from Australia, Chile/the Atacama, Egypt, and other places. The following three people are very similar in that they all believe that they have found meteorites -- and that the scientists who analyzed their stones are working together in a conspiracy to keep their finds from being recognized. Their supposed meteorites are no different chemically than terrestrial rocks, and do not (usually) look remotely like meteorites. In some cases, these parties have managed to sell some of their finds. If you have bought a "meteorite" from any of these parties, I urge you to send a sample to a reputable institutional lab so that charges may be filed against these people. Steven Curry - and more. Curry has gone to a number of reputable labs and scientists attempting to verify his samples. They all told him that his Colorado river-rocks weren't lunar meteorites. Instead of believing the world's experts on meteorites, Curry decided to believe that there was a massive conspiracy aimed at keeping his "meteorites" from being recognized. He has taken to badmouthing what has slowly become the majority of scientists willing to analyze meteorites for laypeople. I'd say it was sad if he wasn't actively selling his fake "meteorites" to people and rock shops throughout Colorado. This fellow may simply be delusional, but he's selling material that was confirmed as non-meteoritic by experts, so we think it's fair to label him a scam-artist. His ebay username is uncometeorites. Steven Curry is currently undergoing prosecution for a number of offenses including "theft, criminal simulation, and fraud." The legal documents associated with the early stages of the case are located here. S. Ray DeRusse - and more. All labs and institutions have verified that DeRusse's samples are terrestrial. He is another fellow who insists that the experts are, for no logical reason, against him. 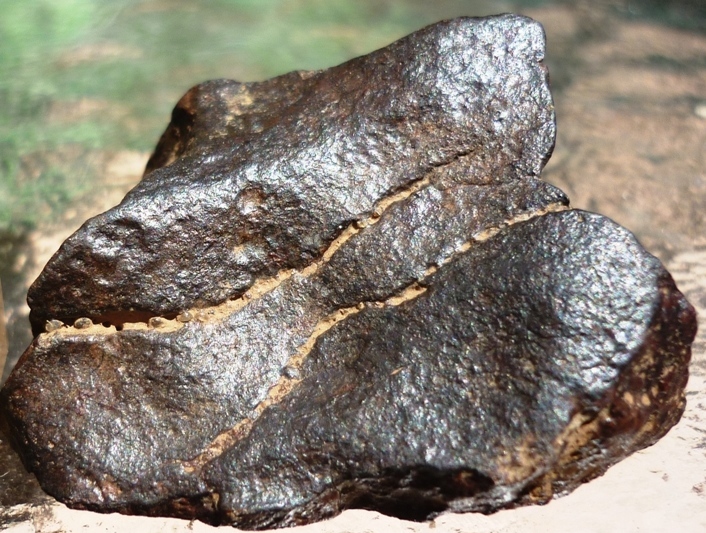 DeRusse was quoted in an online article as having said, "We do have some of the rarest meteorites that have been found. This is not an issue of debate.” In his mind, if 15+ world-renowned researchers disagree with DeRusse, they are the ones who must be wrong. Goran Lindfors - and more. I'm sorry, but this needs to be mentioned. It involves the co-star of the TV-show "Meteorite Men." I feel uneasy with posting any details: please see this article. A related video has since been deleted. We have heard many other sketchy stories about dealers we would otherwise and...used to trust. Our best advice is to always exercise caution in every deal. If you don't, and you're in this business for long enough, it will come back to bite you. We know that very few people would be willing to make a page like this for legal reasons. It should be noted that we do not falsely accuse anyone of anything on this page. It is my personal belief that people should be made aware of the more...controversial...instances in the world of meteorite collecting so that they might be better-informed the next time they make a purchase. Know your sources and read up on the material. Always research a given meteorite before you buy a specimen.